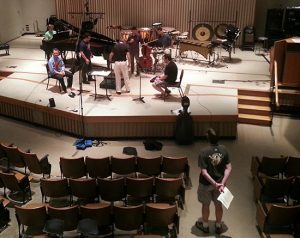 Rehearsal for Even Exchange at the Wellesley Composers Conference. Live performance by Ensemble Pamplemousse, April 13, 2013. Even Exchange was written as a part of Ensemble Pamplemousse’s “BLOCKS” program, in which the pieces were first played in their original form and then taken apart and recombined with each other to create a live mash-up on the second half of the concert. With this in mind, Even Exchange is itself divided into contrasting “blocks” of material for easy division and recombination. The piece contains two types of material juxtaposed, a slow-moving harmonic progression with shifting rhythmic patterns, and a noisy, percussive interplay of different sounds. These two types of music evolve continuously through the entirety of the piece. However, every so often the instruments trade places. This creates abrupt contrasts as instruments suddenly shift between the harmonic and the noisy material, while still being unified through a gradual evolution from start to finish.